The GrabIt Medium went into production in early June. A new video was placed on YouTube and the Ebay auction entry was modified to include both the Lite and Medium. The GrabIt is also being described and sold through the Hilfling website at http://www.hilflinghorseshoes.com/. True to my belief that a pitcher should not have to purchase a pair of horseshoes without first trying them out, I have made a demo shoe available at the Maryland tournament sites. In addition, I have sent out demo shoes to a variety of pitchers throughout the country for testing. I am excited about work in progress to design a new horseshoe. This horseshoe is more traditional in design, however, there are some unique characteristics built-in. I am taking advantage of 3D printing, which permits me to evaluate the design before sending to the foundry for prototype casting. I have been busy testing and evaluating various CAD packages. Most of the work I am doing in Blender. I am excited about this section. This section is the culmination of all of my practice, testing, revising, log keeping, etc. I now have the confidence that when I step to the approach I will throw a ringer. I will describe in detail each aspect of my grip, setup, swing and release. However, I need to preface the description with a little history. A recurrence of a back problem and little bursitis along with the heat here on the east coast, kept me sidelined for a period of time. It was a blessing in disguise. I dug out my notebook and practice log and began to review them. There it was. Page after page of notes and daily practice sheets showed a tendency to miss the stake left everytime I was practicing some particular aspect of my setup, swing, release, etc. Why, I wondered? Actually, it was pretty simple. I grabbed my horseshoe with laser attached and walked with a natural stride and arm swing, paying particular attention to where the laser beam ended up with each stride. The laser beam would swing from right to left pretty much to center. The natural stride of a human generally has the right shoulder and arm swinging leftward when the left leg steps forward and opposite on the right leg stride. So, why not take advantage of my natural tendencies? Below is a description of the changes made to accommodate these natural tendencies. I am excited to describe the approach below. I hope that anyone flipping from 30 feet will give this approach a test. Last Monday night, at my sand league, I finished my last game with 28 ringers out of 36 shoes. 13 of 18 on the first half and 15 of 18 on the second half. Change 1 — Approach. This is the most important change. I moved to the right side approach. I switched the line of flight string from the left side approach to the right side approach. This changed everything. Change 2 — Stance. My right foot is placed on the right edge of the approach with my entire weight on my right foot. The left foot is parallel to the right and a foot length ahead of the right with no weight. By straightening my left leg to the point where my left toe is barely touching the approach, I can easily step forward early. Placing the entire weight on my right foot does two things. It forces me to lean slightly rightward which permits the shoe to pass by my right leg without any manipulation; and, allows me to step forward with my left foot without rocking my body further rightward when I lift the foot to step forward. It also allows me to make my stride smoother and plant quicker. Step 3 — Grip. There is no change here. A continuation of what I had been doing. I take a grip that is firm, but, not with tension. I want to make sure that the shoe has no movement of any kind in my fingers. I rest the shoe against my right leg and make sure that the line of flight string is directly below the center of gravity of the shoe. Further, I extend my arm until I feel a slight tug on my tricep. I don’t want my arm to shorten at anytime during the swing. Change 4 — Visual Alignment. Having moved to the right side approach provided a bonus. On the left side approach, my visual alignment point was 22 inches to the right of the stake. On the right side approach the visual alignment point is with the point of the left hook calk of the horseshoe on the right edge of the stake. This eliminates the need to refocus back to the stake. From the right side, I focus on the stake throughout the entire address, stride and swing. My point of focus changes depending on whether a shoe is already there or is the first to arrive at the stake. My target for the first shoe is the base of the stake assuming I’m the first to throw. If a shoe is already resident, I focus slightly higher on the stake. Step 5 — Downswing. I start the downswing very slowly. If I rush the downswing I don’t have time to stride forward properly. I want the shoe to pass as closely to my right leg as possible. I cannot stress the importance of this aspect of the swing. If I start with the shoe resting on my right leg and I hit my visual alignment point, I know that any shoe that passes very closely to my right leg will be on the line of flight. In my case, if I tick my pant leg, it’s a good thing. Change 6 — Stride. I must be vigilant here. The natural tendency is to stride toward the stake, but, it is imperative that I stride straight at the opposite approach. I must remember that I am taking advantage of my natural tendency to swing toward center. It is important to note that I have not abandoned the pendulum swing. The swing is still in a straight line. It is just as if the hub (shoulder) has been turned slightly leftward, but it is still a pendulum swing. To insure that I am still on target during the back swing I don’t begin my stride forward until the shoe has passed by my right leg. Change 7 — Forward Swing and Release. This is the most exciting part of the process. First, I must make sure that I have planted my left foot before the shoe leaves my hand. A rushed downswing will upset the entire sequence. When I step directly forward it places my eyes directly over the target line. I simply swing at what I am looking at. There are no angles involved. Normally, there is a triangle formed between the eyes to the stake and the arm swing to the stake. Throwing from the right side approach permits me to look straight down the target line. UPDATE — For the past three weeks I have been using the setup mentioned above. The results have been phenomenal. The highlight was the winning of the Maryland State Elders Doubles championship. In addition, last Monday night I threw 29 ringers out of a possible 36 with a score of 87 with a string of 16 ringers in a row. I’ve also had a half dozen games over 70 points out of 108 possible. To complete the excitement, I’ve joined the Pro Horseshoe Tour as a Class II competitor. A review of my tournament results indicated that I frequently lost single points to my turn shoe competitor. I kept hearing, “ringer each, 1 point.” It was apparent that turners had the distinct advantage when accumulating single points. I needed to reduce the number of lost points and decided that I was simply coming in too low and hard. I needed to drop the shoe in a little higher and softer, so that my missed ringers remained in the single point range. I visited my local landfill and picked up a 15″ used tire. I cut off 1/4 of the tire so that water did not accumulate and left wings around the base to anchor the shoe inside of the pit. 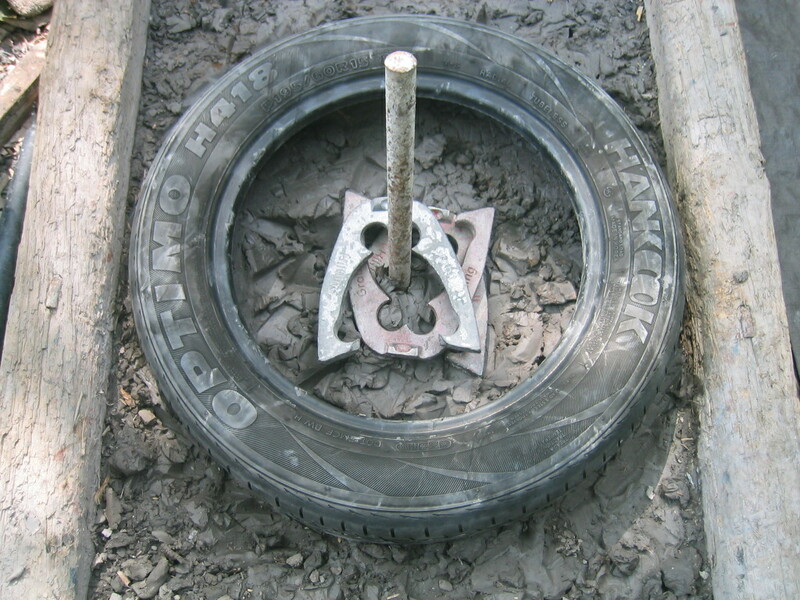 I positioned the tire so that the stake was centered. It works perfectly and I’m learning to loft the shoe a little higher and softer. Photo below.